Cancellation Policy:Cancellations requested up to 30 days prior to check-in date will not be charged and will have 100% of the amounts refunded via bank deposit if amounts are paid.Cancellations made with a maximum of 8 days in advance: 50% of the daily rates for each reservation or room reservation will be retained, and the guest can choose another date to reschedule the reservation.Cancellations after the deadline, less than 8 days in advance: 50% of the daily rates for each vacancy or room of the reservation will be withheld.No-show: 100% of the daily rate of each reservation will be withheld. Reservations are made by payment of 50% of total reservation value and confirmed by email. The payment is made at check in in cash, credit or debit card. The hostel and pousada has a free shuttle service to / from Ubatuba bus station. Youth under 18 years of age can only stay with written parental consent. 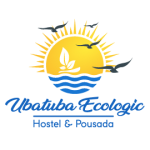 Ubatuba Ecologic Hostel and Pousada is located on Perequê-Açu beach, a beach of waters suitable for bathing, very quiet and beautiful. It is close to the northern beaches of Ubatuba (the best in our opinion), public transportation, and downtown Ubatuba. The Hostel and Pousada lies in an oasis of tranquility in Ubatuba, even in the high season. You will love because of the environment, the outdoor area, the more than 100 beaches of Ubatuba, a large part easily accessible from our locality. For the evenings we are right next to the city center and its restaurants and bars. Our space is good for couples, groups, individual adventures and events. Our suites have air conditioning, fans, cable TV, WiFi, and we serve a delicious breakfast. We have as a principle the struggle for social, cultural and environmental sustainability. If you want tranquility in a beautiful environment, with a lounge room 11 meters high, games, and ample spaces to rest, this is the place. We have received many foreigners and couples, families and groups that can relax by the pool or even use our gourmet space with equipped kitchen or our bar service. If you do not know Ubatuba, come straight to the best of here. If you do already know, you have found the best place to have everything that Ubatuba has to offer. Make your reservations at the best prices right here, booking directly with us!